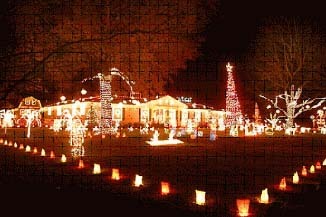 The different ways people decorate their yards for the holidays are as unique as their individual personalities. Some people are zany and colorful, while others are reserved and elegant. With all of the different styles of lights available for decorating, literally any design scheme that can be conceived of can be executed. When you decorate your yard for the holidays, you’re showing the world that you care enough about cheer and good will to dedicate the time and energy to transform the front of your house into a spectacular sentiment of Christmas wonder. Never try to hang lights from unsafe heights. Always make sure that your lights are secured to your home so they don’t fall. Make sure your lights are resistant enough to withstand the elements. Make sure that all of your bulbs work prior to hanging them up to avoid multiple trips up the ladder. Always wear safety glasses when setting up outdoor lights. Whether you live in a climate that doesn’t permit snowfall, or you just like the look of them, snowflake lights are classic Christmas decorations that have stood the test of time. Snowflake lights offer homes that don’t have natural snow on them some of that winter luster while eliminating the mess and cold weather from the equation. Snowflake lights come in a variety of styles, shapes and colors and fit in perfectly with any other decorations around them. Never tacky and always perfect for seasonal decorating, snowflake lights are chosen by decorators time and time again because of their classic elegance and beauty. 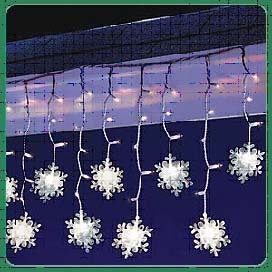 And if you want to eliminate the hassle of decorating your home with big bulky lights, try using mini lights. Mini lights give off a subtle glow, are easy to put up and never get bright to the point of excess. Mini lights are perfect for accentuating special parts of the home or office, and come in a variety of styles and colors. Perfect for the decorator who values subtlety but knows how to achieve pizzazz, mini lights are great standbys to fulfill any holiday decorating need.